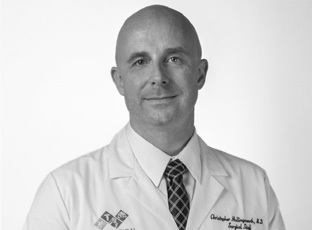 Christopher C. Hollingsworth, MD is a board eligible General Surgeon with a rich background of experience from extensive training in the United States and Europe. After completing undergraduate studies at the University of Southern California, he studied medicine and surgery at The Royal College of Surgeons in Dublin, Ireland. Following graduation from medical school, he worked at James Connolly Memorial Hospital in Dublin, training in surgical oncology, breast surgery and endoscopy. He then accepted a position as surgical resident at the University of Nevada School of Medicine’s Department of Surgery. His training at UNLV Medical Center provided extensive experience in general surgery, vascular surgery, plastic surgery, pediatric surgery, trauma and critical care. He received the Arnold P Gold award for humanism and excellence in teaching as a resident at University Medical Center in Las Vegas. This prestigious award is given to the few selected residents across all residency programs that excel in compassion, empathy, and integrity. Dr. Hollingsworth undertook fellowship training in minimally invasive endovascular surgery, complex hernia repair, and body contouring procedures in massive weight loss patients at NYC Surgical Associates with Drs. Greuner and Rosenberg. He excels in providing the latest techniques to his patients, offering comprehensive treatment plans for all of their needs. His disarming demeanor, excellent bedside manner, devotion to patient care, and technical skill set make him a tremendous asset to NYC Surgical Associates. Dr. Hollingsworth is active in media, previously working as the Editor of a global magazine with publication on three continents and in seven languages. He has authored numerous articles on topics in the healthcare industry. Outside of medicine, Dr. Hollingsworth enjoys spending time with his wife and daughter, and is enthusiastic about computers, nutrition, extreme sports, and motor sports. He is licensed to practice medicine and surgery in New York, and is conversant in Spanish.